what is the Best Reverse polarity protection circuit for battery? I have just finished building a crude charger for my 12V 9Ah Lead Acid battery using LM317. Everything works perfectly but I need to have a reverse polarity protection circuit for my charger since it will be handled by novice people. This way the load will get supply only if the diode is forward biased, if it is reverse biased the diode will block the flow of current and thus protecting your circuit. Hi Violet, thanks for the quick reply. So I am looking for an alternative. Hi Bradyen welcome to circuit digest forums.. This is by far the best circuit I have come across. 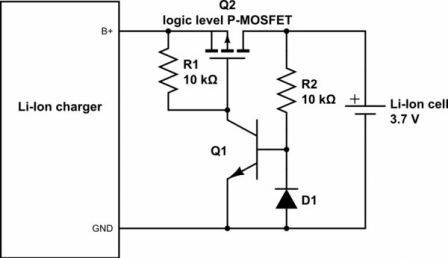 The MOSFET conducts only when the battery is connected with proper polarity, during reverse polarity the MOSFET remains turned off and thus protects the charger and load. Thanks Aswinth, on the first look I could not understand how th circuit works. But will google for more info and try it out on my test board. If everything works I am going to use it for my charger. Using a MOSFET is a good idea, but is would just like to share one more option that uses a commonly available diode and fuse. Simple connect the diode in parallel to the charger output so that the conducts only if the battery is connected in reverse polarity also add a fuse in series to it. How to find transistors Emitter, Base, and Collector with Multimeter?